As most techies know, Skype uses a proprietary protocol and does not support inbound SIP calls. If you ask Skype CEO, Niklas Zennstrom why Skype chose their own proprietary protocol, (which many reporters have asked him), he always gives the same canned reply - that they chose their own proprietary protocol because SIP doesn't do everything they need, SIP has issues traversing firewalls, our proprietary protocol is more flexible, blah blah blah. Even though there are now NAT traversal solutions for SIP that perhaps didn't exist a couple of years ago, Skype still hasn't moved to SIP and it doesn't look like they will. Part of the blog post rants how SIP-based softphone users can't communicate with Skype users. Well, today I learned that a new Skype-to-SIP gateway called Skype SIP Gateway (PE) 1.0 from Zhink.com was recently released. This product allows two callers, one on Skype and the other with a SIP address, to communicate with each other. Sweet! By configuring this product and any SIP server (such as OpenSER, Asterisk, etc.) correctly, you can come up with many interesting working scenarios. Forward Skype callers who are your friends to your mobile number. This is very much like personal “skypeout”. Reject all Skype callers whom you do not know. Allow yourself and family members with own Skype accounts to call into interactive voice response system provided by Sip server. With this, you can do things like access your voice mails or dial out to PSTN lines. 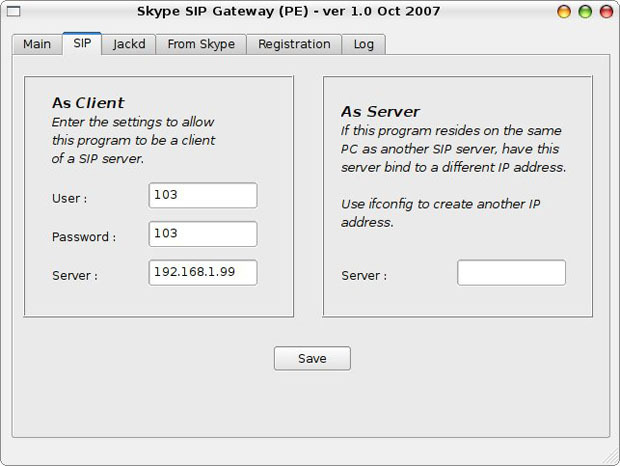 Using multiple Skype To Sip Gateways, you can now allow Sip users on different private Sip servers to communicate, using the gateways to provide internet connection via Skype network. This is much like local PBXs of branches of a company connected via internet. Note: This will require multiple PCs, each hosting one Personal Edition of this gateway. 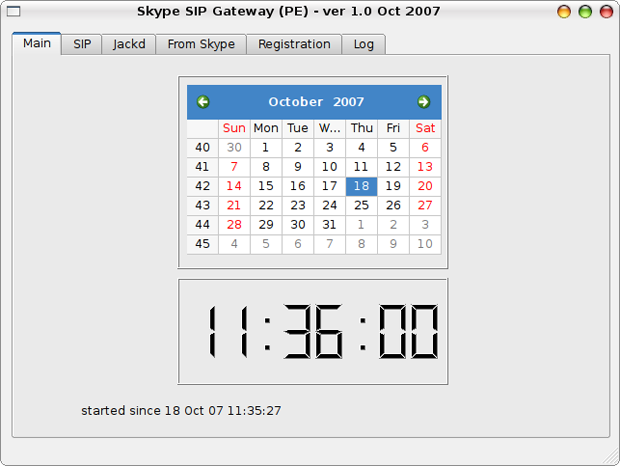 Allow Sip users on softphones like Ekiga, X-Lite and many others to contact Skype callers directly. The Sip users need not have Skype accounts. This screenshot above is interesting because I noticed it is using the jackd daemon. The jackd daemon is part of JACK, "a low-latency audio server, written for POSIX conformant operating systems such as GNU/Linux and Apple's OS X. It can connect a number of different applications to an audio device, as well as allowing them to share audio between themselves. Its clients can run in their own processes (ie. as normal applications), or can they can run within the JACK server." Obviously, JACK must be that heart of how this application works. It must be muxing the audio from the Skype application into a standard SIP call using the RTP stream. Ironic, that since this requires JACK, this Skype to SIP gateway only runs on Linux - which is often the last operating system to get Skype updates. The software allows you to talk for 1 minute for free without registration. It costs $25 to register. A cool application you should try out. \nPart of the blog post rants how SIP-based softphone users can't communicate with Skype users. Well, today I learned that a new Skype-to-SIP gateway called Skype SIP Gateway (PE) 1.0 from Zhink.com was recently released. This product allows two callers, one on Skype and the other with a SIP address, to communicate with each other. Sweet! By configuring this product and any SIP server (such as OpenSER, Asterisk, etc.) correctly, you can come up with many interesting working scenarios. \n This screenshot above is interesting because I noticed it is using the jackd daemon. The jackd daemon is part of JACK, "a low-latency audio server, written for POSIX conformant operating systems such as GNU/Linux and Apple's OS X. It can connect a number of different applications to an audio device, as well as allowing them to share audio between themselves. Its clients can run in their own processes (ie. as normal applications), or can they can run within the JACK server." \nObviously, JACK must be that heart of how this application works. It must be muxing the audio from the Skype application into a standard SIP call using the RTP stream. Ironic, that since this requires JACK, this Skype to SIP gateway only runs on Linux - which is often the last operating system to get Skype updates. The software allows you to talk for 1 minute for free without registration. It costs \$25 to register. A cool application you should try out.